A seven-branched electric menorah donated by the Iszauk family of White Oak, Pa. Rauh Jewish History Program & Archives at the Heinz History Center. The Rauh Jewish History Program & Archives recently acquired this charming electric menorah from the Iszauk family of White Oak, Pa., a borough outside McKeesport. It is a hefty brass lamp with seven branches. Each branch is topped with a glass light bulb molded into the shape of a flame. A series of switches around the base operates the bulbs. The seven branches indicate that this menorah was decorative rather than ritualistic. The menorah used on Chanukah has nine branches—eight to commemorate the eight-day holiday and a ninth for the shames, or “helper” candle, used to light the others. 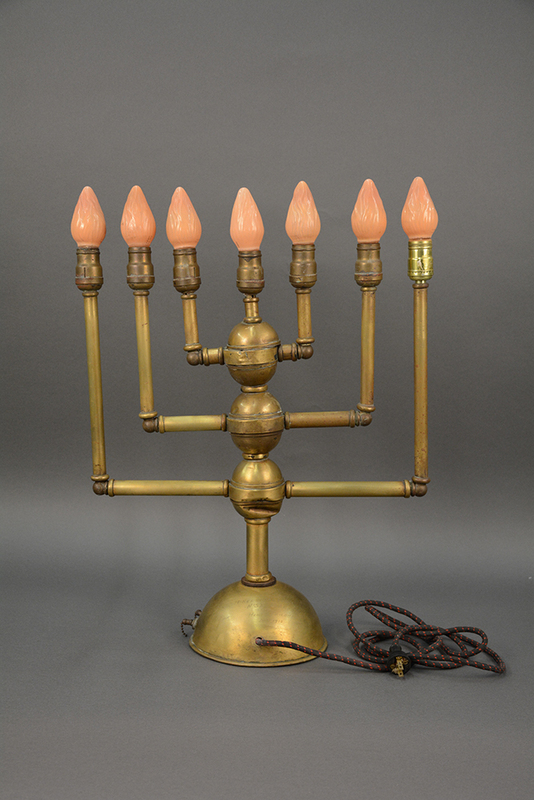 A seven-branched candelabrum recalls the menorah used in the ancient Temple in Jerusalem. No one in the Jewish community in McKeesport could provide any information about the origins of the electric menorah, but an inscription on its base offers two clues. The first clue is the name: Henry Friedman. Henry Friedman (1870-1934) was born in an Austro-Hungarian village in present-day Slovakia and immigrated to the U.S. in 1889. He arrived in New York City speaking five languages and learned English by taking evening classes. His language skills made him valuable in the “foreign banking” industry. Foreign banks helped recent immigrants maintain contact with relatives abroad by facilitating remittances and travel. Henry Friedman (1870-1934) came to McKeesport in 1899, after a decade in New York City and Philadelphia. He became a leading member of the Jewish community and a respected figure in the local business community. Jewish Criterion, March 2, 1928, page 22, Pittsburgh Jewish Newspaper Project. Friedman came to McKeesport, Pa. in 1899, after working for foreign banks in New York City and Philadelphia. He joined the foreign banking firm of Joseph Roth & Son and soon married Anna Roth, the daughter of the senior member of the firm, Joseph Roth. 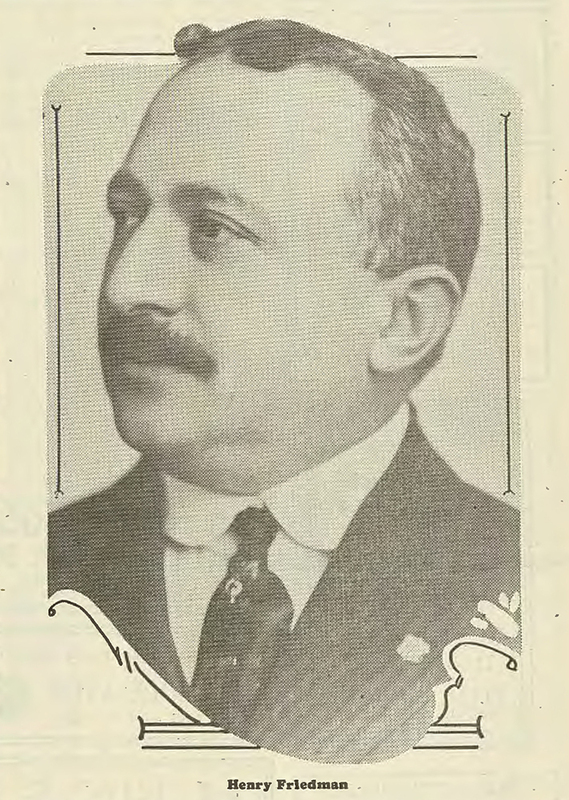 A profile of Friedman in the 1904 volume “Memoirs of Allegheny County” notes that he was a member of Gemilas Chesed Congregation “and several other lodges.” These affiliations would have been fairly typical for men such as Friedman. Gemlias Chesed was an Orthodox congregation founded in 1886 by Austro-Hungarian immigrants. 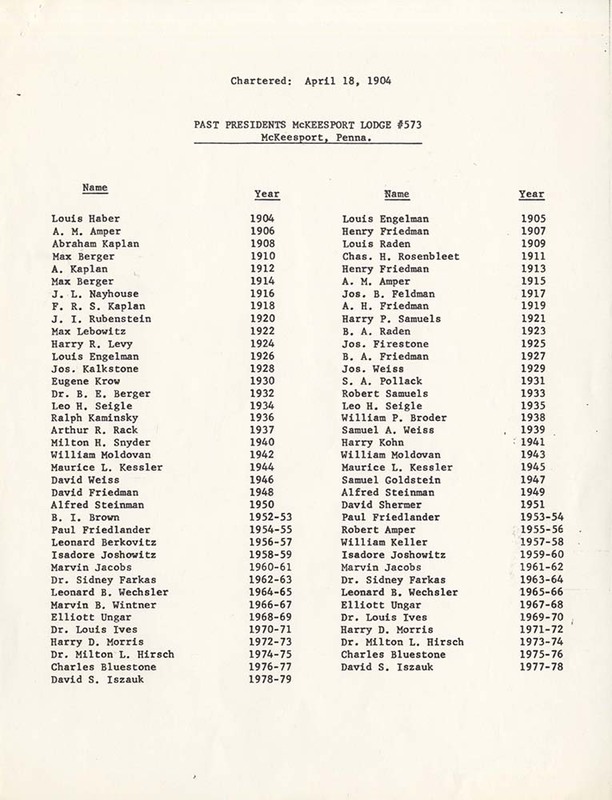 These affiliations suggest that Friedman was a leader of the large Jewish community of McKeesport, which grew from 650 people in 1907 to 3,000 in 1919, according to figures in the American Jewish Yearbook. Throughout most of the 20th century, McKeesport had the second largest Jewish population in Western Pennsylvania, after Pittsburgh. 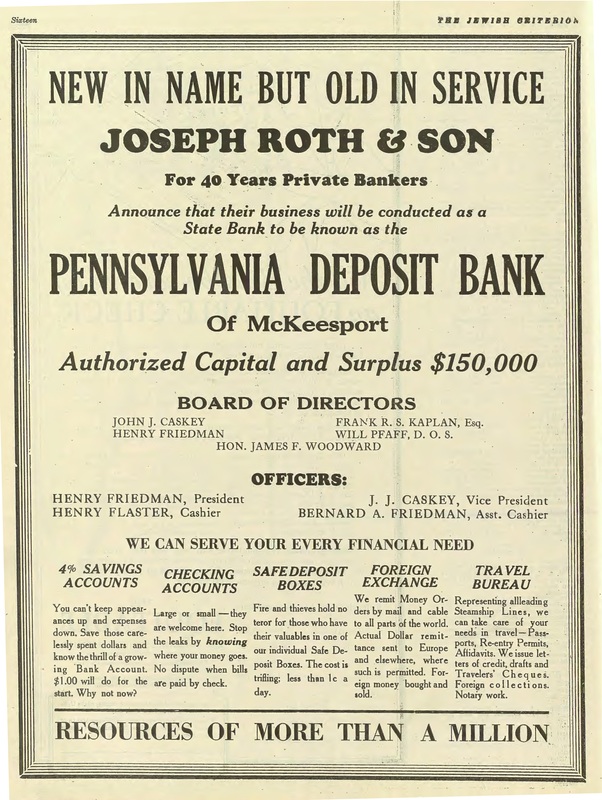 After 40 years as a private institution, the foreign bank Joseph Roth and Son of McKeesport, Pa. became a state bank in 1928. Jewish Criterion, March 2, 1928, page 16, Pittsburgh Jewish Newspaper Project. Henry Friedman served two terms as president of the B’nai B’rith McKeesport Lodge No. 573, in 1907 and 1913. B’nai B’rith McKeesport Lodge No. 573 Records, MSS 565, Rauh Jewish History Program & Archives at the Heinz History Center. 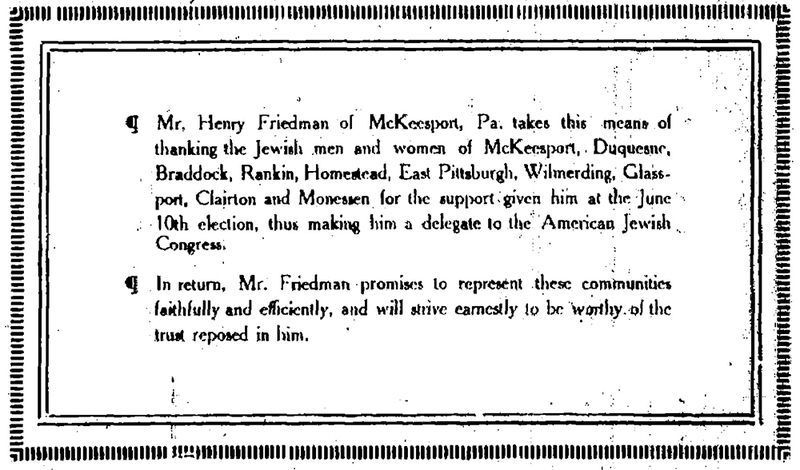 Henry Friedman placed this advertisement in the June 22, 1917 edition of the Jewish Criterion to thank Jewish communities in the Steel Valley for choosing him to be the district delegate to the American Jewish Congress. Jewish Criterion, June 22, 1917, page 9, Pittsburgh Jewish Newspaper Project. Unexpectedly, the profile also listed Friedman as a member of fraternal organizations that had no religious or ethnic affiliation, such as the Elks and the Knights of Pythias. And it noted that he had been treasurer of the McKeesport Chamber of Commerce for seven years. Affiliations such as these were rare for Jewish immigrants in the early 20th century and show that Freidman had gained the respect of the McKeesport business community. As president of Joseph Roth & Son, Freidman oversaw a major reorganization of the bank in 1928. After four decades as a private corporation, it became a state bank called the Pennsylvania Deposit Bank of McKeesport. The reason, according to an article in the local Jewish Criterion, was that “McKeesport’s foreign born element is fast becoming Americanized in desires and ideas.” Unmentioned was the fact that the Johnson–Reed Act of 1924 had severely restricted immigration from southern and eastern Europe. The bank still catered to customers with family abroad. “Its foreign department speaks and corresponds in eleven different languages, representing all leading steamship lines, forwarding money orders by mail and cable to all parts of the world, transmitting actual dollar remittances in all parts of the world where such is permitted,” the article noted. All these biographical details present a sketch of a man who was deeply involved in Jewish causes and also engaged in the wider civic concerns of McKeesport. (BELOW) B’nai B’rith McKeesport Lodge No. 573 used the seven-branched menorah as its symbol for most of its existence. The style changed over the years but the meaning stayed the same. 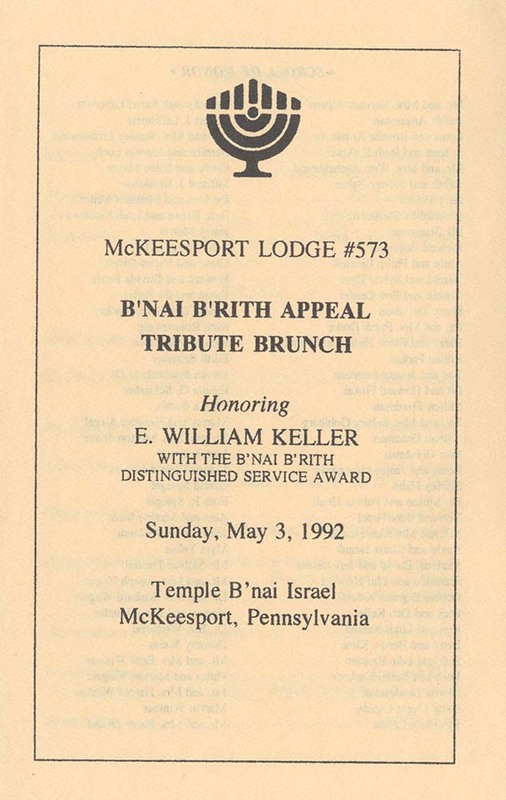 B’nai B’rith McKeesport Lodge No. 573 Records, MSS 565, Rauh Jewish History Program & Archives at the Heinz History Center. 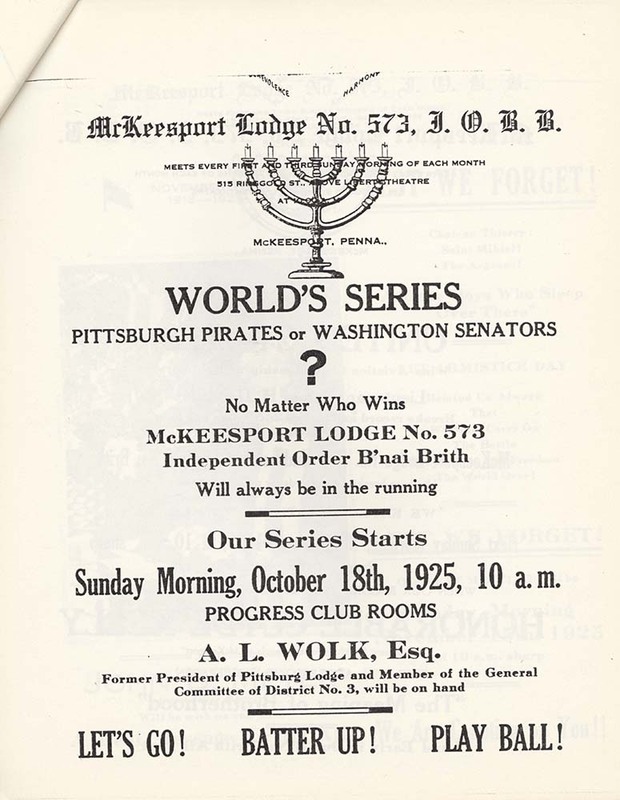 The second clue about the menorah is the recipient: McKeesport Lodge No. 573 IOBB. IOBB stands for International Order of B’nai B’rith, a Jewish humanitarian organization that played an important role in small-town Jewish communities across America. Its non-denominational status allowed members to sidestep some of the sectarian tensions between Orthodox and Reform groups and collaborate on communitywide projects. 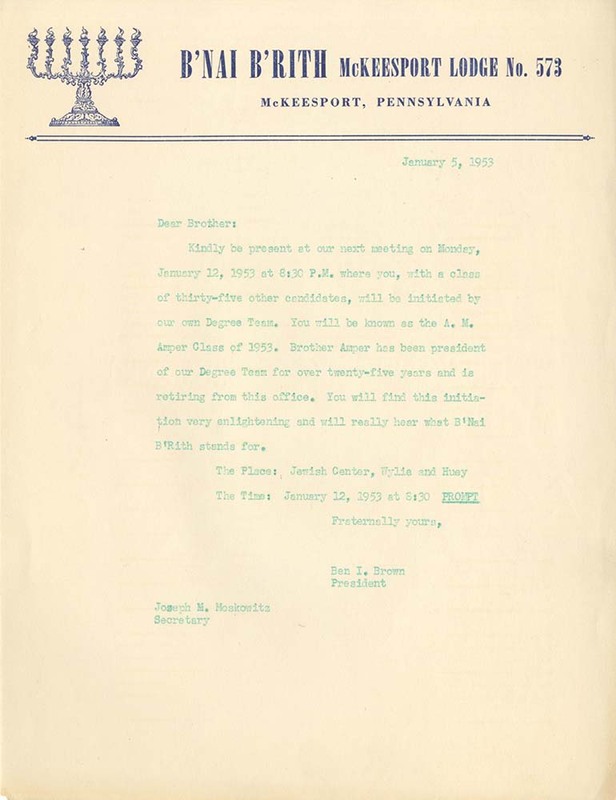 B’nai B’rith sponsored some of the first Jewish religious schools in Western Pennsylvania. The International Order of B’nai B’rith McKeesport Lodge No. 573 was chartered on April 18, 1904 and grew five-fold over its first year, to more than 100 members. This rapid growth forced the young organization to regularly seek out more spacious accommodations for its meetings. A history of the lodge by former president Leo Seigle listed the Roth Bank Building as one of the early homes of the B’nai B’rith lodge. In addition to playing host, Friedman led the lodge. He was president in 1907 and again in 1913. The date inscribed on the menorah—June 1912—suggests that his gift may have been a gesture of gratitude for his second election, or perhaps a way to gain support for his campaign. 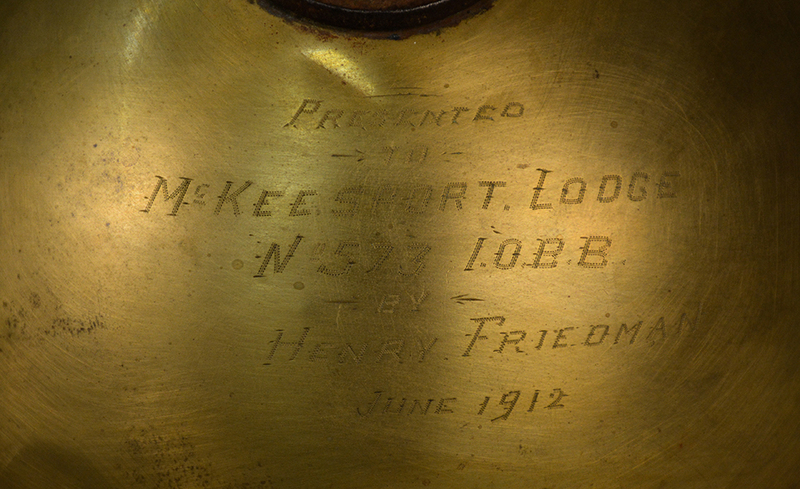 Regardless of the reason, the menorah likely impressed the members of the lodge at a time when electrification was still a luxury throughout much of the country. But why did Freidman donate a seven-branched menorah, of all things? 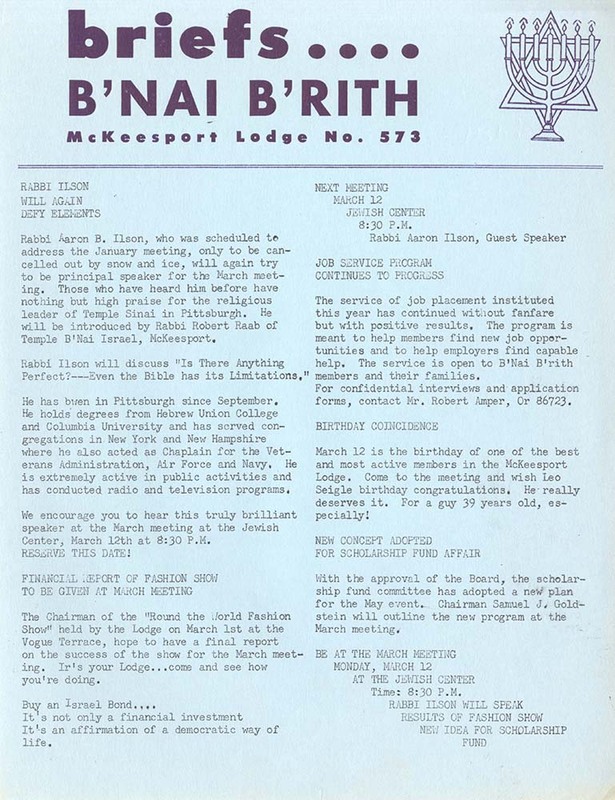 B’nai B’rith started in 1843 in in New York City as a beneficial organization. It quickly adopted more ambitious goals. At an early meeting, the organization chose the seven-branched menorah as its official symbol. The symbol represented the ritual menorah of the ancient Temple in Jerusalem but was also a hopeful symbol of light, making it ideal for a group dedicated to promoting Jewish ideals and advancing humanistic concerns. Like its parent organization, McKeesport Lodge No. 573 also adopted the seven-branched menorah as its symbol. Versions of it appear on documents as early as 1925 and as late as 1992. For Friedman, who preserved Jewish ideals through his communal activities and engaged a broad spectrum of humanity through his professional work, the twin meanings of the seven-branched menorah must have been particularly resonant. His gift appears to be a way of announcing his dedication to the mission of the lodge. Eric Lidji is the director of the Rauh Jewish History Program & Archives at the Heinz History Center. Fascinating. Please keep these coming! Thank you for your interesting research about my grandfather although I knew nothing about this item or it’s whereabouts. Wow this is a great article, thanks very much! I love the bank’s advertisement – Resource of Over a Million! Eric Lidji’s ability to research, write and share this history and the preservation of this remarkable artifact at the Heinz/ Rauh Center for future generations is fabulous. Cheers to the Iszauk family for their stewardship and donation of the McKeesport Menorah. Everyone should know that Sam directed the definitive history of Jewish McKeesport with his documentary “Missing McKeesport,” released earlier this year. I’m going to ask at the library for a copy of the “Missing McKeesport” Jews. I wonder if many have returned to Israel or are thy just up on the “hill” in West Versailes. My Grandfather was from Hungary so I wonder if there are some relatives I can find today nearby in White Oak or McKeesport area. Presently no libraries have a copy of Missing McKeesport for viewing although moving forward I am hoping that arrangement can occur. I really liked how so many different historical elements/artifacts were brought together to help tell this story. Completely fascinating! Great historical research, and a well-told story. Thank you! news, only it is not fiction, it is faction! What are the 4 Jewish fraternal and 5 Jewish organizational groups you refer to in the essay above? Well done! Interesting, informative, and entertaining! All signs in this blog point toward an excellent researcher, careful writer, passionate archivist and overall cool guy.